The May Full Moon falls on May 10th this year. It’s known as the Flower Moon, and it’s coming on the heels of Beltane, the festival of the Goddess Flora–a combination that makes for a particularly potent flower-fest! To celebrate, you’re invited to join our Facebook live meditation on the evening of May 10th, where we’ll call in the energy of the Full Flower Moon to nurture our own blossoming. Join us here! The Wheel of the Year, the calendar of our ancestors honoured by many still today, consists of eight holidays called Sabbats, based on the cycles of earth and the seasons. The two greatest days are Halloween, which is considered New Year’s Eve and the start of the wheel, and its opposite, May Day, also known by many as Beltane. At Beltane, May 1, the Goddess manifests as the May Queen, Flora, Brighid and Maeve. Flora is the Roman Goddess of flowers, love and youthful pleasure. She is one of the primal powers that presides over the growth of the natural world; everything that grows, blossoms, or bears fruit is within her care. She nurtures that within the human spirit that recognizes beauty, our own blossoming. Beltane celebrates life–flowers, fertility, sensuality, and delight–and honours the union of mother earth with the fertility god. Through their love-making life blossoms all around. This is a time for gift-giving. Hang a basket full of spring flowers on a neighbour’s doorknob, but don’t let the neighbour see you! If you get caught, you are supposed to get a kiss. As new life blossoms in gardens all around us, allow the lush abundance to nurture your own blossoming. In what ways do you want to blossom this spring? May Flora and the Full Flower Moon bring you regeneration, abundance, and deep, deep joy! 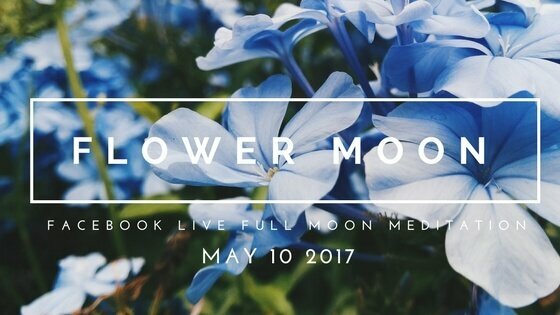 Tune in with me live on Facebook May 10th at 5:30pm EST to meditate with May’s Flower Moon. We’ll gather virtually to invite and celebrate the flourishing of fertility, sensuality, new life…and our own blossoming. Click here to get details.